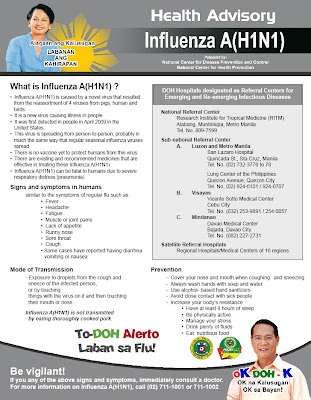 Here in our country the cases of Influenza A (N1H1) is beginning to rise as of this moment there are 54 cases in our country this virus is spreading fast, but still many Filipinos doesn't know what is this virus and what to do in case they have it so I decided to post here the FAQ about Influenza A (N1H1) from The DOH, Lets help to spread the information about this virus to avoid the fast spreading of the virus. Spread the word not the virus. Post the Health Advisory on any, anywhere you can post it. What is Influenza A (H1N1)? Why this new Influenza A(H1N1) virus is sometimes called “swine flu”? * This virus was originally referred to as “swine flu” because laboratory tests showed that many of the genes in this new virus were very similar to influenza viruses that normally occur in pigs in North America. But further study has shown that this new virus is very different from what normally circulates in North American pigs. It has two genes from flu viruses that normally circulate in pigs in Europe and Asia and avian genes and human genes. Scientists call this a “quadruple reassortant” virus. Do pigs carry this virus and can people catch this virus from a pig? * At this time, there is no evidence that swine in the United States are infected with this new virus. However, there are flu viruses that commonly cause outbreaks of illness in pigs. Most of the time, these viruses do not infect people, but influenza viruses can spread back and forth between pigs and people. Are there human infections with this virus? * Yes. Cases of human infection with this virus were first confirmed in the U.S. in Southern California and near Guadalupe Country, Texas. The outbreak intensified rapidly from that time and more and more states have been reporting cases of illness from this virus. Other countries with confirmed cases include Mexico, United States, Canada, Australia, Austria, New Zealand, Japan, Korea, China (Mainland China, Hongkong), Portugal, Poland, Guatemala, Spain, Costa Rica, Colombia, Denmark, El Salvador, France, Germany, Ireland, Israel, Italy, Netherlands, Norway, Sweden, Switzerland, United Kingdom, Brazil, Argentina, Panama. Is this new virus contagious? * Yes, Influenza A(H1N1) virus is contagious and is spreading from human to human. However, at this time, it is not known how easily the virus spreads between people. What are the signs and symptoms of this virus in humans? * Some cases have reported diarrhea, nausea and vomiting. How severe is illness associated with this virus? * It is not known at this time how severe this virus will be in the general population. Experts are studying the medical histories of people who have been infected with this virus to determine whether some people may be at greater risk from infection, serious illness, or hospitalization from the virus. How does Influenza A(H1N1) virus spread? Can I get infected with Influenza A(H1N1) from eating or preparing pork? * The virus is killed by cooking temperatures of 160 F/70 C.
What is the incubation period? How long can an infected person spread Influenza A(H1N1) to others? * Infected person maybe contagious from one day before they develop symptoms to up to 7 days after they get sick. Children might potentially be contagious for longer periods. Are there medicines to treat infection with AH1N1? * Yes. Oseltamivirr or zanamivir are the recommended drugs to treat and or prevent infection with this virus. You have to consult a doctor before using these drugs to avoid resistance. Is there prophylaxis for the Influenza A(H1N1)? * Yes. For further information refer to Interim Guideline # 1. Is vaccine available to protect people from getting infected with AH1N1? * No, at present there is no vaccine against this virus. How can we prevent the spread of the virus? * Wash hands regularly with soap and water, at least for 20 seconds (or use alcohol-based hand sanitizers) especially after handling patients and specimen, before and after eating, after using the toilet and as necessary. * Avoid touching your eyes, nose or mouth. Germs spread this way. * Avoid close contact with sick people. * Stay home if you are sick until you are free from symptoms to prevent the spread of the virus. What to do if somebody gets sick? * • If there is flu like symptoms, consult the doctor immediately. * Report to the proper health authorities . Is there a pandemic risk on Influenza A(H1N1)? * Yes. If the Influenza A(H1N1) establishes efficient and sustained human-to-human transmission then it can cause an influenza pandemic. The impact of a pandemic is difficult to predict. It depends on virulence of the virus, existing immunity among people, cross protection by antibodies acquired from seasonal influenza infection and host factors. If you have flu like symptoms and history of travel to Influenza A(H1N1) affected countries/areas, immediately consult a doctor. Thank you so much for making this blog it's a great help for us. hello friends I really liked this information, a few days ago I read something similar on a site called wound infections, I would like to receive updates on this issue, as it is very interesting, thanks! All content within this Blog is provided for general information only, and should not be treated as a substitute for the medical advice of your own doctor or any other health care professional. This Blog is not responsible or liable for any diagnosis made by a user based on this content. This Blog is not liable for the contents of any external internet sites listed, nor does it endorse any commercial product or service mentioned or advised on this blog. Always consult your own GP if you're in any way concerned about your health.